Fr. Ramon Caviedas, the Franciscan friar who built the Sampaloc cemetery located at the hills of Balic-balic, Sampaloc, Manila, was himself buried on a cemetery located on the hills of La Loma (called cementerio de Binondo as it was formerly part of the jurisdiction of Santa Cruz, Manila during the Spanish colonial period). Photo right: Today, one enters the former Binondo cemetery from Jose Abad Santos. 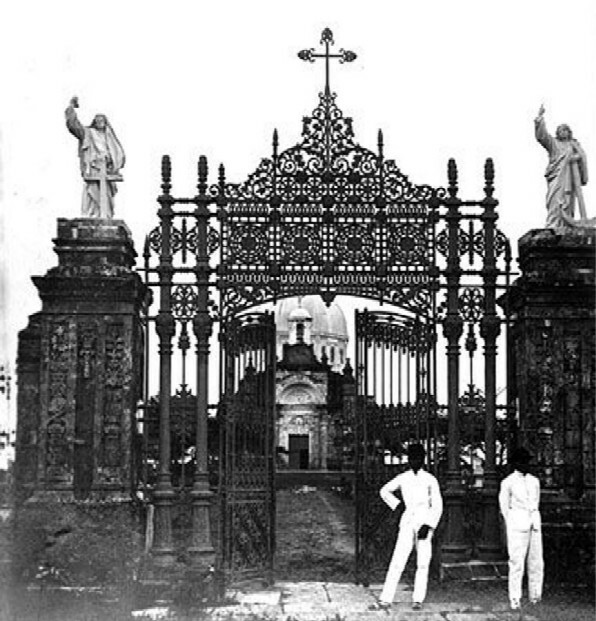 Note the iron gate with the “campo santo de la loma” sign. The design shows a degree of similarity with the original, and very beautiful, wrought iron grill gate of Binondo cemetery. According to Architect Lorelei D.C. de Viana, the cemetery of Binondo was surrounded by a three meter high stone masonry fence and had distinctive wrought iron grill gate with statues of angels guarding it. Below is an 1899 image taken from a stereograph printed by Underwood and Underwood. 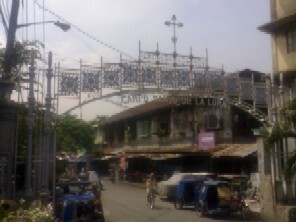 The photo above shows the original iron grill main gate (with two smaller side gates) of Binondo cemetery located at La Loma. The funerary chapel can be seen from the background with the distinctive dome design. However, what is interesting to note are the two iron column pairs which bears strong resemblance to the iron columns that stands in today’s entrance to La Loma cemetery. What happened to these very beautiful cemetery gate? Photo above shows what remains of the once very beautiful gate of Binondo cemetery – a mute memorial to the neglect of historical and church heritage architecture. The wrought iron gates are no more…one asks again, were the gates sold to scrap iron dealers, or to antique dealers? 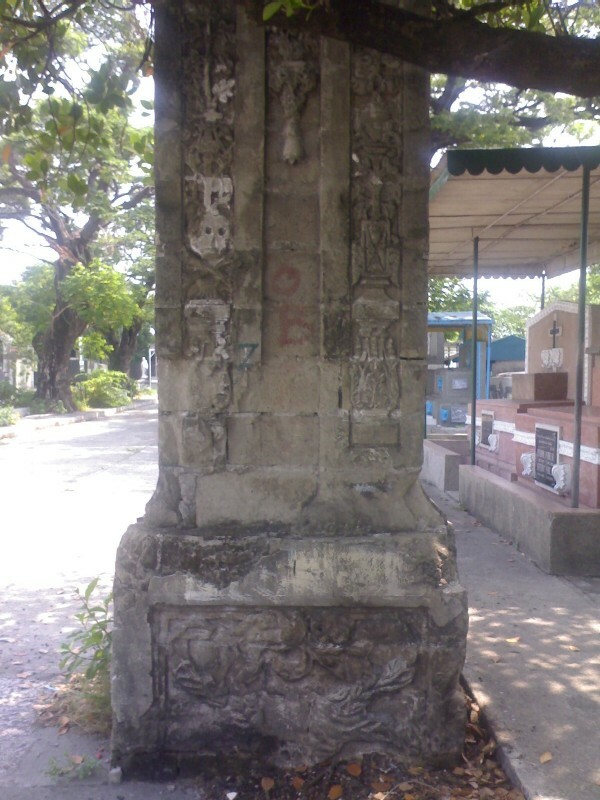 Close-up of what remains of the right stone column of the main entrance to Binondo cemetery complete with graffiti. ~ by Martin Gaerlan on July 7, 2007. I don’t know about this interesting site. Is it in Santa Cruz or Binondo? 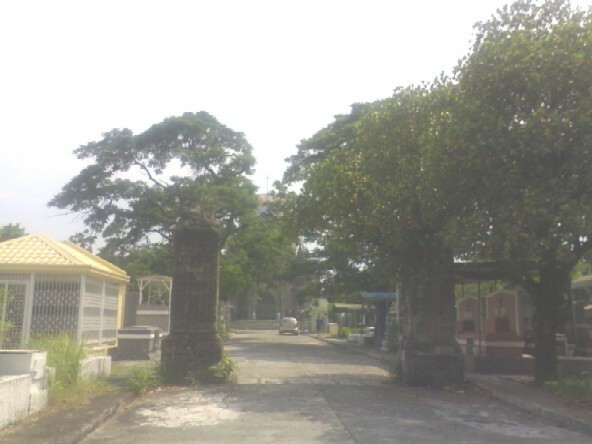 La Loma cemetery closer to the Chinese cemetery and the North Cemetery of Manila. 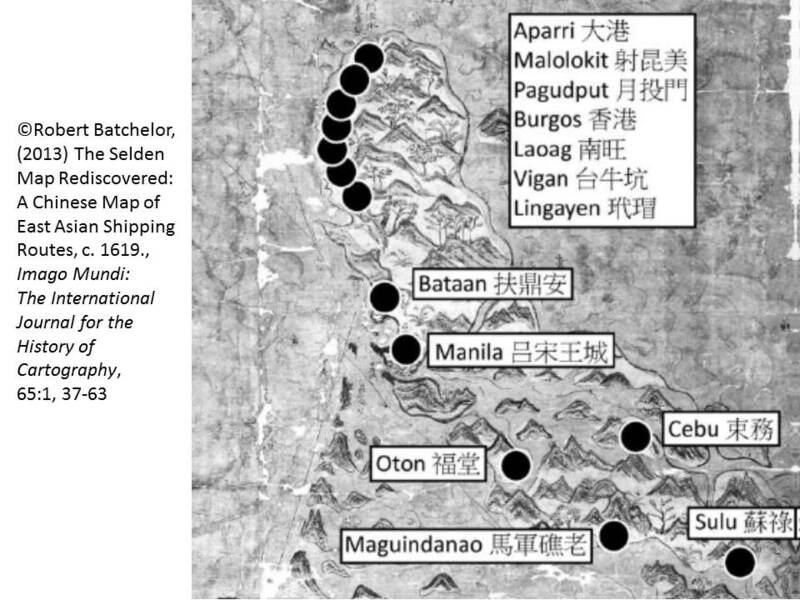 is this the same as the Binondo Catholic Cemetery of the 1900’s? I am in search of my great grandmother’s remains. Hope someone can help. yes, same cemetery. You may proceed to La Loma Catholic cemetery and check if the burial records contain the name of your grandmother. However, you need to have an idea of date of death or date of burial. Thank you for this information. We are doing some research on Manila Cemeteries & I found this website. Can I ask where you got your primary data (on the establishment of the campo santo)? Thank you and your help is greatly appreciated! For Binondo cemetery, see work by Arch. 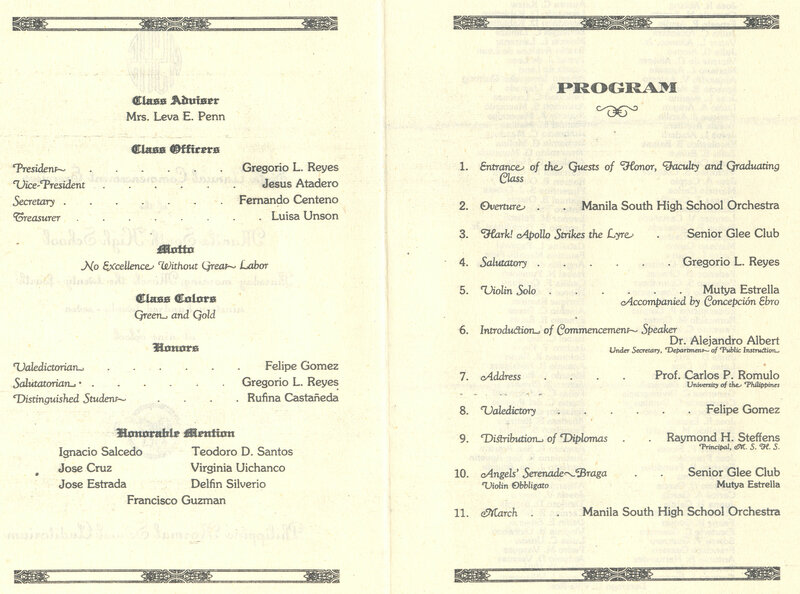 Lorelie de Viana, “Public Sanitation and Cemeteries in 19th Century Manila.” UNITAS, 2004, Vol 77, No 1., pp. 87-132.Are you doing undergraduate or graduate level research? Hi, thank you for the reply! I am doing a graduate research at UP.Do you mind if I get your email address for a personal transaction? Thanks again! OMG! I don’t think it is a similarity. I think it is all part of the original gate. What a waste of an important heritage structure. I wish the city government would bring it back to how it stood in the late 1800’s. I was just reviewing the posts and i was surprised that i did ask help from you in 2009. thanks to your reply then and yes, i found my grandmothers remains. She is Maria Carpena, Philippines’ first recording artist. She is not listed though in the personalities buried at La Loma. Sad that she has been long forgotten and her contribution to Philippine Music and Theater. Thank you for your feedback and I am glad that museo santisima trinidad was of some help in your search for the remains of Maria Carpena, your grandma. regards. finally all my question was answered when I read this. My father was also buried near in the the main entrance gate. its really amazing we always park our car near in that stone, and I thought soul or ghost was inside the old church. and i cant help my self to took a picture every time we visit my father there, old church is really an eye catcher. 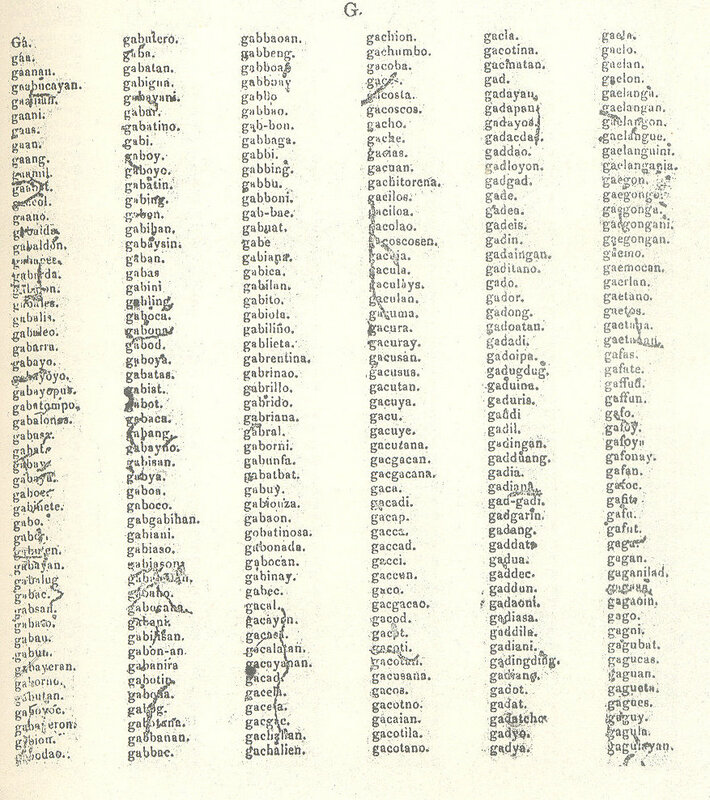 what are the burial practices during the spanish colonization?